Little Weirdos: Mini figures and other monster toys: Have you met the amazing Moon Goon People? Have you met the amazing Moon Goon People? In addition to the usual mini figure suspects like Monster in My Pocket and M.U.S.C.L.E., I've always had a weakness for really obscure, extra weird little rubber crap. The Moon Goon People, pictured to the right, are probably as shining of an example of obscure, weird rubber crap as any I've encountered. I first saw these things on a couple people's Flickr pages (including a member named Astronit's, who has a bunch of really cool retro space toys in his collection), and immediately said, "Want!!" Then I recently saw a carded set up for grabs on eBay and knew resistance was futile. There is so much awesome going on here. 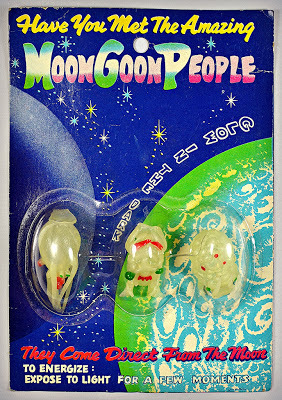 First, the over-the-top, campy packaging that begins by asking us the very important question mark-less question, "Have You Met The Amazing Moon Goon People." To that I respond, "Yes I have, thanks for asking!" 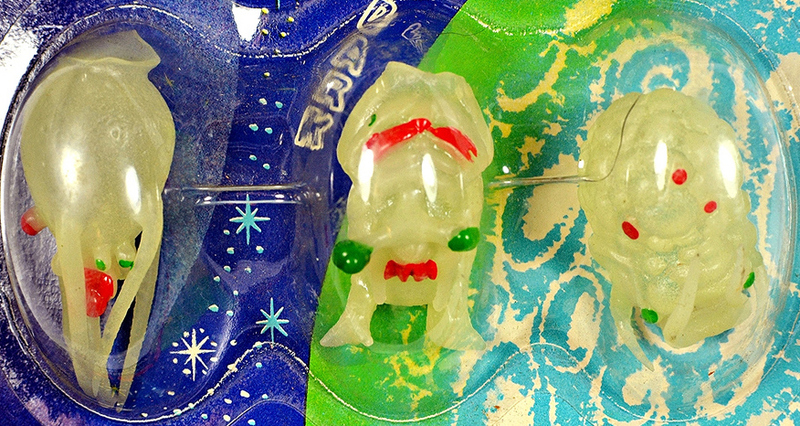 Then the package lets us know that these freaky dudes glow in the dark (I checked, and they still do), and that "they come direct from the moon." Good to know. I'm not sure exactly when these are from because all that's on the package is what you see on the front, including "Japan" in small type on the bottom right. From the looks of the artwork and the general wacky space creature vibe of the toys, though, I'd guess they were produced sometime in the 1960s. On the left we have a tentacled squid-like creature. The other two Moon Goons I'm not even sure how to begin to describe, beyond something like "bulbous cranium things." They are awesomely bizarre. It definitely took some imagination to come up with these designs. Apparently the credit should go to artist Edd Cartier, as the figures are based on illustrations Cartier did for a series called "The Interstellar Zoo" that was part of a 1951 science fiction anthology titled Travelers of Space. Check out this link for more on that. Pretty cool, huh? 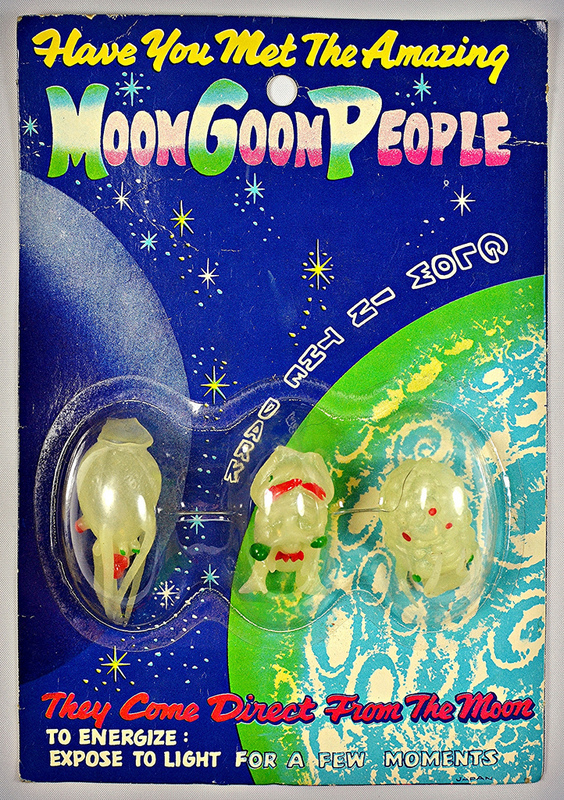 If anyone has any additional information about the Moon Goon People, including exactly when and where they were sold, please let me know! All I know is they're plentiful at people want to get rid of them - I have that same carded set! Still really likeable though - the one on the right reminds me of that big round robot thing from Defenders Of The Earth. Did you get yours on eBay? Not sure but I think there might be just one person selling them who had a whole case of unopened packs or something. Yep, eBay, maybe... three years ago?